Google’s first keynote for its I/O 2012 conference was jam packed. One of the biggest draws was the skydiving demo for Google Glass by Sergey Brin. For people who have never heard of Google’s Glass project, this video sums up the ultimate goal of the project perfectly. Of course, the project is still a ways off from reaching the same functionality seen in the video, but it’s making progress and attendees of I/O this year were given the opportunity to “beta” Google Glass next year for a cool $1,500. However, the main draw for me was Google’s immediate plans for its mobile operating system, Android. Jelly Bean, Android 4.1, was revealed on stage with a number of improvement over Ice Cream Sandwich, which was just announced at the end of October 2011. For all the features, check here. However, I wanted to point out some of my favorite features of Jelly Bean. 1. Notifications: Notifications are getting a huge makeover in Jelly Bean. Ice Cream Sandwich improved on the foundation of notifications with easy swiping to dismiss notifications, but Jelly Bean improves the notification experience. Notifications are now expandable and provide more information than ever before. Instead of seeing “gmail 2 messages,” as I often see in my notification tray, I’ll be able to see who it’s from, the subject, and probably a small part of the e-mail. Android users will also be able to perform actions within the notification screen such as responding to text messages (there are 3rd party apps that allow this already), calling people back, or writing an e-mail. Unfortunately, Jelly Bean still doesn’t have a native power menu widget, but I’m sure custom ROMs like AOKP will have our needs covered. Edit June 30, 2012: After trying Jelly Bean’s preview build, it seems we can’t do text messaging or gmail from the notification menu. Maybe it’ll be in the final build or third party apps will take advantage of the expandable notification to do so. So far I can call from notifications and do some minor stuff for Google+. Sorry for being misleading! Google will hopefully refine and expand their suite of apps as time goes on. Being able to text or e-mail all from the notifications area would be the dream! For now, we’ll have to continue tapping a notification to go to the app. At least we can see more than just “2 messages”! 2. Google Now and Advanced Search: Google Now along with a number of other improvements to voice search seem to be Google’s answer to Apple’s Siri. With a simple swipe on the homescreen, Google Now will provide you with information relevant to you such as maps and alternate routes to avoid traffic on the commute to work, weather for the day, and more. It can also provide you with sports scores, transportation logistics at an airport, subway, or bus stop, and much more. All of this is contingent on the user letting the phone (and Google) know more about themselves, their habits, and their hobbies. Voice-to-text has been improved to work while offline and voice search now provides answers to questions (the example used at the Keynote was “Who is Japan’s Prime Minister”), while also providing you with “cards” that include search results related to the question. In the example of “Who is Japan’s Prime Minister?” I imagine cards popping up for the Wikipedia entry and an image of him from Google Images at the very least. The cards that show up utilize the user’s search patterns as well to provide more meaningful results. 3. Butter… Lots of Butter: Jelly Bean has been tweaked for a smooth experience, both on the homescreen (transitions) and in apps. I’ve been a fan of DroidTh3ory’s custom ROMs and one of the things he adds to every update notes is in regards to butter. Buttery smooth performance. The Android team added “Project Butter” (I kid you not) to Jelly Bean and it really does show. If you’re interested in the “how” of all this, read through the full changes. I also heard rumors that one of tomorrow’s talks will be centered around Project Butter, so more info should come soon. 4. It’s Coming Soon: I won’t lie. One of the best things about Jelly Bean is that it’ll be ready for primetime in a few weeks (mid to late July). Galaxy Nexus (GSM/HSPA) and Nexus S phones and Motorola Xoom tablets should expect to be the first wave of devices with the update. CDMA/LTE Galaxy Nexus friends can expect the update sooner than many other handsets, but those who have their device unlocked and rooted should find a custom ROM of Jelly Bean soon after the release of the source code. I personally cannot wait for roman of AOKP to add all the AOKP features I take for granted to Jelly Bean. Jelly Bean also supports 720×720 contacts, but I’m not sure if this is an overarching change to Google Contacts or just another bump up in contact resolution. I REALLY hope it’s a change to Google Contacts because I hate needing to edit every contact’s picture with a higher resolution picture after I flash a new ROM. 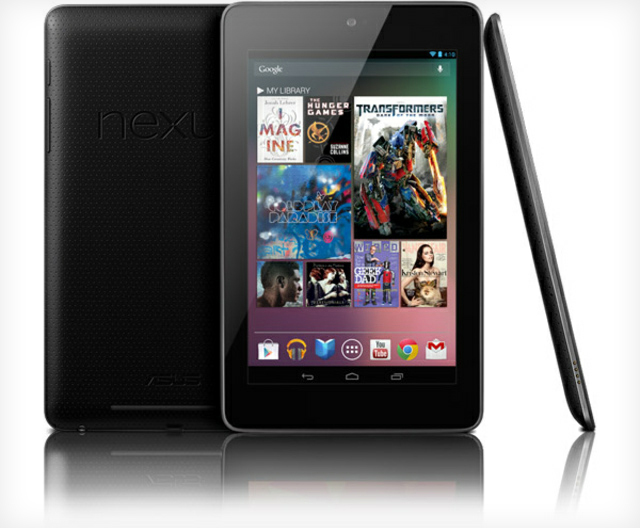 Along with Jelly Bean, Google made its Nexus 7 official. It’ll have a 7″ 1280×800 pixel HD display, a quad-core Tegra 3 CPU, 12-core GPU, 1 GB RAM, 8 or 16 GB of internal storage, 1.2 mp front-facing camera, WiFi and Bluetooth connectivity, and NFC. It will also be the first device with Jelly Bean and was built around the Play Store’s media capabilities (music, video, movies, books, magazines). Unfortunately, this also means there will be no microSD card slot since Google is trying to encourage cloud solutions – whether it’s by buying media through the Play Store or streaming it through Google Drive. This is a small set back for people like me who listens to a lot of lossless (.flac) music and rather store media locally in case I am not near WiFi, but Google (kind of) understands and allows some information to be downloaded to be used offline – this works for movies, books, and music although with 8-16 GB options, it may fill up quickly. Google also showed off the newest version of Google Maps, which also allows users to download an entire city for use offline. Of course, the Nexus 7 is a “true” Google experience device unlike Amazon’s Kindle Fire and Barnes and Noble’s Nook Color and Nook Tablet. It will also be sold at $199 for the 8 GB model and $249 for the 16 GB model and is available now for preorder with shipments starting in mid-July. I already preordered mine in the 16 GB variant and can’t wait to get my hands on it… although I’ll have to figure out the storage issue since I enjoy listening to lossless music and reading scanned comics on my tablets. Over all, an exciting first day for Google. As an Android fan, I am excited to see the OS grow more with new innovation. On the flip side, as an Android fan, I am sad that some of my fellow users are still waiting for an update from Gingerbread to Ice Cream Sandwich or some of them just started enjoying their Ice Cream Sandwich. Me, on the other hand, will be happily playing with Jelly Bean in a month or so. A Nexus phone is a powerful device and it’s not because of quick updates – it’s because of the community of developers that congregate around it and release custom ROMs with the latest flavor of Android quickly. After using AOKP since February, I, personally, cannot see myself using stock Ice Cream Sandwich. Some of Google’s next steps will have to be to develop deeper relations and protocols with OEMs and carriers to get updates pushed to phones in a timely manner. Google did announce a tentative strategy with OEMs and carriers last year to support all devices for at least a year, but has been silent about it since then. What did everyone else think about Google I/O so far? Google+ has blown up the last couple of weeks and today was the craziest. Anyone else buying a Nexus 7 tablet and if so, what are your thoughts about storage? Anyone as excited as I am for Jelly Bean to come to phones? Let me know your thoughts in the comments! End Note: After seeing Jelly Bean’s unveiling today, I have a feeling we won’t have Key Lime Pie this fall. Instead, maybe Google will hold Key Lime Pie for Google I/O 2013 and unveil the Galaxy Nexus’s successor at the same time. This will give plenty of time to include a TI OMAP5430 or 5432 at a reasonable price since these are slated to release in Q3 2012. If Google is going to be selling phones directly, it’ll need to wait a few months for cutting edge parts to be cheaper (and less cutting edge) to sell the phone at an affordable price. This will also be in line with Google’s earlier commitment to about one Android revision a year. However, this does not line up with the Wall Street Journal’s rumor of five Nexus devices by the end of the year. The Nexus 7 joins the Galaxy Nexus as two of the five devices. ← Ready for Google’s Nexus 7?